Snow-capped mountains, freshwater lochs and the wild countryside make Scotland one of the most beautiful countries in the world. Off Scotland’s North West coast lies The Isle of Skye which is the largest island in the Inner Hebrides. With its waterfalls, coral beaches, rocky mountain range, stunning coastline and a seemingly never-ending amount of scenic views, The Isle of Sky is a true joy to visit, so why not put those January blues to one side and plan an Easter break. Don’t forget, time flies! 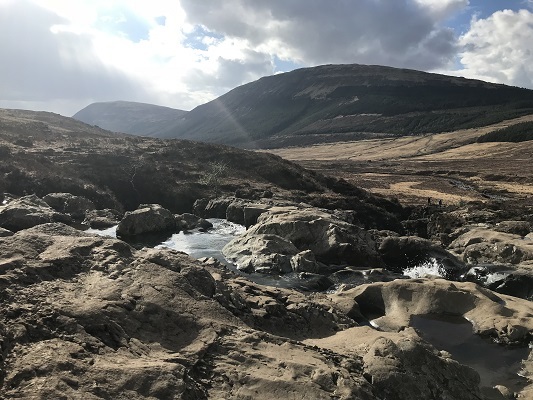 It can be a long drive although the route to the Isle of Skye is very picturesque and there are plenty of beautiful places to stop along the way. In many ways, the road trip is part of the whole experience! With Skye being an island there are only two ways to get there. The ferry from Mallaig to Armadale is a lovely short crossing and a great way to enjoy the views of the Scottish coastline. If you have time and choose to go this way, it’s a good idea to book the crossing in advance although it is possible to board on a standby basis. Alternatively, the Skye Bridge links mainland Scotland to Skye and is free to use. If you can, I would recommend going there on the ferry and coming back over the bridge. Just set your satnav for Mallaig for the ferry, or Kyle of Lochalsh for the bridge. On the way back it’s Armadale for the ferry and Kyleakin for the bridge. If you are travelling up from the south you will pass through the wonderful Glencoe mountains and carry on over the Ballachulish bridge up to Fort William. From there the road winds around numerous lochs, picturesque countryside, Loch Nan Uamh and up to Mallaig. When you get to Skye, you won’t be disappointed where ever you decide to stay as the whole Island is very beautiful. The main town is Portree where there are a couple of convenience stores and plenty of restaurants selling seasonal locally produced food. If you are staying in self-catering accommodation there is a good local butcher in the portakabin behind Howdens joinery on Dunvegan Road. There are so many places to see in Skye. One of the main attractions are the Fairy Pools and they make for a very enjoyable walk. The waters are a crystal turquoise blue and the whole of the falls are backdropped by mountains. Afterwards, you can follow the road down to Glenbrittle to find a sandy beach overlooking Loch Brittle and where the sun sets over the water. If you are into your Whisky then you have probably already heard of the Talisker Distillery which is Skye’s oldest working whisky distillery. Visitors have the opportunity to watch the whisky production first hand on one of their site tours. It’s not always possible to pre-book a tour and if you arrive early there is the Oyster Shed also in the village of Carbost and just up the hill from the distillery where you can enjoy some super fresh oysters and seafood cooked and prepared to order. When the weather’s good, Coral Beach is another popular attraction and is about 20min walk from the car park in Claigan to a beach made from crushed baked seaweed that looks remarkably similar to crushed corals. From the Coral beach and on the other side of Loch Bay and over the fairy bridge lies the magical lands of the Waternish peninsula. Here you will find The Stein Inn which is Skye’s oldest Pub and with a spectacular beer garden overlooking the loch. After all that travelling and exploring, enjoying a pint and a wee dram while watching the boats come in is often very well appreciated.